A current research project based in the Great Plains Center for Agricultural Health (GPCAH) is investigating methods to improve air quality in swine farrowing buildings1. The research team developed models to estimate room concentrations of multiple indoor contaminants [ammonia, dust, hydrogen sulfide, carbon monoxide, and carbon dioxide (CO2)] and conducted field monitoring to evaluate the effectiveness of using ventilation and engineering controls. In both modeling and field work, the researchers found that CO2 concentrations exceeded recommended workplace limits for swine workers2 (1540 ppm) over the entire winter season and also exceeded one-half the Occupational Safety and Health Administration (OSHA) permissible exposure limit (PEL=5000 ppm), which is based on exposure to a single contaminant (unlike what exists in swine buildings). Sources of CO2 in livestock production include both animal respiration (exhaled breath) and combustion products from heaters. Since controlling animal breathing is infeasible, the team evaluated whether the unvented heaters commonly used throughout the Midwest (e.g., LB White heaters) were a significant contributor to high CO2 levels measured in livestock buildings. In fall 2014, researchers installed new gas-fired heaters, the Effinity93 (60K BTU, approximately $500 more than equivalent LB White unit), in a test barn. The team measured concentrations throughout the following winter, comparing them to that of the previous winter with traditional unvented heaters. To protect the unit from dust, fresh air intake to the combustion device was from outside the farrowing building, and combustion gases were exhausted from the unit to outside the building. The investigators identified that CO2 was reduced by 800 ppm with the new heaters. Another 200 ppm difference in CO2 between seasons was attributed to colder outdoor temperature and larger in-room animal population in the winter with the older unvented heaters. Other vented gas-fired heaters are available, and the researchers recommend substituting unvented heaters with vented units that have stainless steel internal components, which should improve the lifespan of the heater when used in livestock environments containing ammonia. 1. See www.public-health.uiowa.edu/gpcah/center-projects/intervention-to-reduce-exposures-in-cafos/ for more details on this larger project. 2. Donham K, Haglind P, Peterson Y, et al. (1989) Environmental and health studies of farm workers in Swedish swine confinement buildings. Brit. J. Industr. Med. 46:31–37. An aerial view of the 2012 Iowa City landfill fire, with smoke primarily from the burning shredded tire drainage layer. 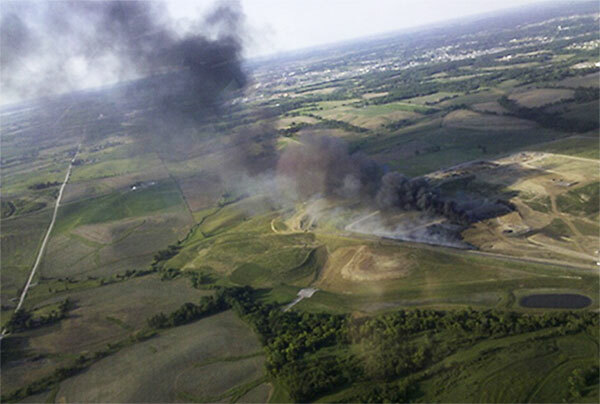 On May 26, 2012, a fire broke out at Iowa City’s municipal landfill. While more than 8,000 landfill fires occur annually in the United States, the Iowa City fire was unusual in that the ignition involved the landfill’s lining system, a three-foot layer of shredded tires designed to protect underlying soil and water. Over the next 18 days, while fire fighters and contractors worked to extinguish the blaze, a column of black smoke was visible for miles as an estimated 1.3 million tires burned. Researchers at the University of Iowa, including associate professor of occupational and environmental health Tom Peters, an expert in inhalation exposures, joined the Johnson County Department of Public Health and state agencies in responding to the crisis. UI researchers monitored emissions from the fire at two stationary sites located 6.5 miles east and 2.5 miles northeast of the landfill. A mobile sampling trailer was also moved as needed to capture the tire fire smoke. The investigators created models of how pollutants were likely to disperse and affect local air quality, and made measurements available to the incident command group so they could advise the public on necessary safety precautions. “Tire fires are relatively rare, and there is not a consensus as to what compounds should be monitored for the best public health response,” says Peters. The UI team took the opportunity to determine potential improvements to the air quality response in terms of how to monitor such fires. They developed a unique tire fire irritant air quality index to interpret the measured pollutants and rank them by acute and cancer hazard ratios. These measures help responders determine when they should take precautions such as closing schools and canceling outdoor events. Fortunately, the impact of the 2012 fire was episodic, and much of the smoke plume was dispersed by winds. However, all locations within one mile of the fire experienced at least one hour of unhealthy air during the 18-day period. Unhealthy conditions extended up to 11 miles downwind for short periods of time. While several toxic substances had been measured in laboratory simulations of tire fires, the UI results determined their strength under real-world burn conditions. One UI recommendation from the tire fire is to shift focus away from the most-commonly recognized tire fire emissions, which include metals and the toxic gas benzene. Instead, overall levels of smoke particles, the gas sulfur dioxide, and the chemical components of the smoke particles may be more important in terms of health effects. The UI team concluded that the landfill fire constituted a serious public health concern. They offered recommendations for future emergency air quality responses, including better preparation, monitoring, modeling, and interpretation of results. The team’s findings were published in the journal Atmospheric Environment. Patrick O’Shaughnessy, professor of occupational and environmental health, recently discussed Iowa’s air quality on Iowa Public Radio’s talk show “River to River.” The show discussed what’s in our air, sources of Iowa’s air pollution, and what residents can do to clean it up. Dust and gasses that accumulate in concentrated animal feeding operations (CAFOs) can pose a serious respiratory health risk to workers, yet research indicates that few wear protective masks on a regular basis. A better—and more cost-effective—way to reduce worker exposure may be to install a ventilation system to control contaminants in a facility, according to Renée Anthony, assistant professor of occupational and environmental health. In a study published in the Journal of Occupational and Environmental Hygiene, the researchers developed and ran computer simulations of various air pollution control systems currently on the market to evaluate their effectiveness in agriculture buildings. Using real-time room concentrations of dust, ammonia, carbon monoxide, and carbon dioxide from a sample swine farrowing facility during the winter months, the model examined operation costs and how effectively the systems removed contaminants. “Producers indicated that the per-pig cost has to be low in order to be viable,” says Anthony. “We were surprised at the number of ventilation options that reduced hazards at well below $1 per pig.” Anthony said this is less than what it might cost to provide respirators and training for workers throughout the year. The researchers are now testing systems in an actual swine farrowing facility to determine if they get similar results in the field. One contaminant that was still difficult to control in each simulation was carbon dioxide. Anthony says it might be possible to reduce carbon dioxide concentrations by changing the heater in the farrowing rooms, which she plans to test in the future. Liz Swanton, who graduated in spring 2014 with an MPH degree, has been working “to cement the partnership” between the University of Iowa’s Environmental Health Sciences Research Center and Trempealeau County, Wisc., where the researchers are conducting a demonstration project to evaluate community exposures to respirible crystalline silica using community volunteers. Air contamination from frac sand mining is a new and increasing concern, not only for researchers, but for also for those living in communities near mines. Frac sand is composed of silica and is a key component in fracking – a process whereby hydraulic pressure is applied to the rock around oil/natural gas wells to enhance extraction. Recent developments in drilling technology have made fracking easier and more economical, thus increasing demand for silica sand. To meet this demand, frac sand mines have recently and rapidly proliferated in many rural Midwestern counties where the sand is plentiful and accessible. The sudden growth of the sand mining industry has raised community concerns about how mining activities affect the environment, human health, and the local economy. I am working on a project that is taking an innovative, interdisciplinary approach to environmental data collection which, until now, has been primarily conducted by trained scientists. Incorporating community-based strategies into air quality research, the University of Iowa Environmental Health Sciences Research Center (EHSRC) is attempting to provide communities with the expertise and resources to address their own research questions. After receiving a grant to assess the impact of silica mining operations, the EHSRC was approached by citizen groups and county boards for information and assistance. One particular request came from a community member attempting to coordinate air sampling research in multiple counties in Wisconsin. His contact with the center helped create our partnership with Trempealeau County, WI, where we are conducting a demonstration project to evaluate community exposures to respirible crystalline silica using community volunteers. The materials developed during the project will be disseminated throughout the region, allowing other counties to conduct their own sampling. My role in this project has been to cement this partnership, to present our project to their board of health, and to prepare the sampling protocols, recruitment materials, and IRB application, with the assistance and scientific expertise of the EHSRC. This process has involved numerous trips to Wisconsin, multiple meetings, and even impromptu discussions with community members (including the owner of the hotel I stayed in). In the next two months, I hope to conduct trainings with our volunteers, provide assistance during the sampling period, revise the protocols and training materials using volunteer input, and develop guidelines on how to interpret and communicate the results to the homeowners where the samples are collected. This project is community engagement at its best; it is the driven by the community, adapted to fit the resources and needs of the community, informed by community input, conducted by those who live in the community, and ultimately designed to allow additional community groups to independently conduct their own research. It is an equally beneficial partnership. Using volunteers from the counties and incorporating community knowledge expands and improves our own ability to examine the health impact of frac sand mining. For Trempealeau County, this project trains community members and builds local capacity creating sustainable changes in a rural county with limited resources. Buried just below the surface of wide stretches of the Midwest lies a natural resource that has only recently skyrocketed in value: silica sand. In the past decade it has played a major role in hydraulic fracturing or “fracking,” a drilling process that has helped the United States hit what many observers consider to be a domestic natural gas jackpot. While fracking has ignited controversy because of its potential to taint water supplies near gas and oil wells, the environmental impact of extracting silica sand is not well understood. With mining companies poised to launch operations in northeast Iowa, concerned citizens there have called upon University of Iowa researchers to investigate. Since about 2005, fracking has flourished in the United States. Energy companies using the technique have unlocked vast stores of natural gas and oil previously believed to be unreachable because they were embedded in shale rock and limestone. Fracking, a high-pressure application of water, chemicals, and silica sand (also known as “frac sand”), creates fissures in the rock, releasing the trapped gas and oil. The frac sand is essential because it infiltrates the cracks and keeps them propped open. 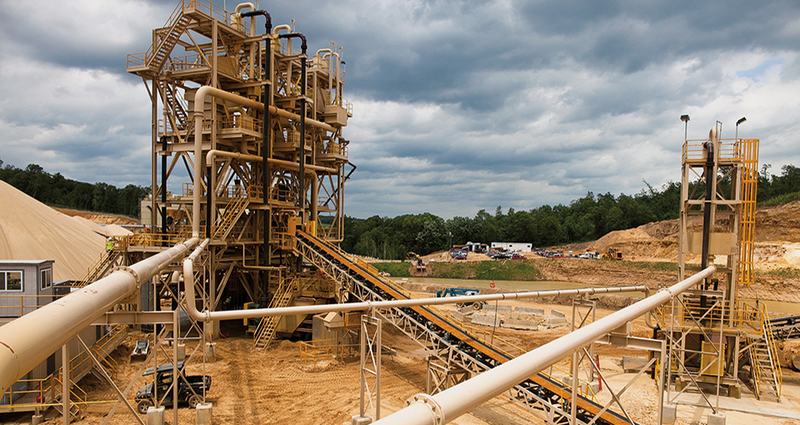 One well can require hundreds or even thousands of tons of frac sand. Constantly hungry for more of the sand, the burgeoning fracking industry has quickly spawned extensive sand mining outposts in Wisconsin, Minnesota, and Illinois. But when mining companies set their sights on deposits in Allamakee and Winneshiek counties in northeast Iowa, residents formed citizen-action groups and got in touch with David Osterberg, a member of the outreach team of the Environmental Health Sciences Research Center (EHSRC) based in the College of Public Health. “Frankly, they’re very worried,” says Osterberg, clinical professor of occupational and environmental health. He says a key concern is crystalline silica. A fine dust that is the byproduct of the mining process, respirable crystalline silica is known to cause silicosis, an incurable scarring of tissue in the lungs that can lead to severe shortness of breath and, eventually, death. Silica exposure has also been linked to other diseases, such as emphysema, tuberculosis, lung cancer, and some immune-system ailments. The U.S. Occupational Safety and Health Administration describes occupational exposure to crystalline silica as “a serious threat” to some 2 million American workers in mining and other industries. But very little is known about the impact of ambient exposure to the dust; that is, exposure to residents of communities surrounding the mining operations. To date, no conclusive evidence has been found that demonstrates that sand mining leads to silicosis in people living in surrounding communities. But silicosis has been identified in farm animals living downwind of sources of crystalline silica. The citizens’ groups convinced the supervisors of Allamakee and Winneshiek counties to impose 18-month moratoria on frac sand mining until they’ve had a chance to consider development of local mining regulations and to assess the impact of mining on the region, which has an economy that depends heavily on tourism and second-home construction. After establishing contacts with several fledgling efforts to monitor air quality around frac sand operations in Wisconsin, the EHSRC procured a $125,000 grant from the National Institute of Environmental Health Sciences in September 2013 to conduct a year-long air-quality study that will unify those projects and generate new research. Led by Peter Thorne, director of the EHSRC and professor and head of occupational and environmental health, the study funds UI researchers to develop novel methods for sampling and monitoring air around mining operations. Tom Peters, associate professor of occupational and environmental health, is directing the exposure assessment portion of the research, which includes real-time monitoring of air affected by mining-related activities, development of low-cost detectors for long-term monitoring, and collection of particles through air sampling. Ryan Grant, a graduate student in biomedical engineering, is working on the real-time monitoring leg, beginning with constructing and deploying a detection device that sits near railroad tracks that service frac sand operations. They will try to identify particles with diameters that range from 2.5 to 10 micrometers and determine if any of the particulate matter includes crystalline silica. Crystalline silica smaller than 4 micrometers is the type most likely to reach the alveoli of the lungs and cause silicosis. Other components of the study lend support to ongoing work. Patrick O’Shaughnessy, professor of occupational and environmental health, will extend current air-sampling efforts by conducting modeling of air conditions, extrapolating the Wisconsin data, for example, to determine how air-quality levels might change at the as-yet-undeveloped Iowa mine locations. And Liz Swanton, a master’s student in the Department of Community and Behavioral Health, will develop training videos to teach public health department personnel how to employ standardized air-monitoring methods that will keep communities informed of whether their local mines are complying with standards. “Mining permits require you to apply dust-suppression techniques to minimize fugitive emissions,” Peters says. “Some people do, some people don’t. There is no monitoring to check.” The low-cost monitors that the team develops will provide a way to check inexpensively. The video training will also ensure a continuing flow of reliable data. All the data will come together into a risk assessment led by Thorne that will inform the public about the levels of exposure and the risks to public health. These findings will be presented at workshops, where UI researchers will advise stakeholders, including policymakers, mining industry representatives, citizens’ groups, and academic institutions. Peters, who has worked on projects with national impact, takes pride in how the work he and his colleagues do on this study will have long-term local benefits.